I grew up going to church. Sunday School when I was young. Youth groups when I was in middle school and high school. I drifted away from all it a bit in college. Sunday morning came early after Saturday nights when I was often up too late. But in that mix of college, I stumbled upon Thomas Merton, the Trappist monk who had lived in the Abbey of Gethsemani in Kentucky. Through his books I discovered both a spirituality and a sense of social justice and responsibility I had not been exposed to growing up which changed my life. Ever since reading A Seven Story Mountain and Raids on the Unspeakable, spirituality and a sense of social justice and responsibility have been the touchstones of my life and faith. In his book The Whole in Our Gospel, Richard Stern, President of World Vision, U.S, recounts the story of Jim Wallis, Founder and President of Sojourners, who, when he was in seminary, along with several friends underlined every passage in the Bible which had to do with poverty, wealth, justice and oppression. They then cut all those verses out the Bible and what they had left barely held together. All of which is to say, that at the center of the Christian witness and the center of my faith, is a concern for those who are often pushed to the margins. The hungry. The poor. The homeless. The sick. The vulnerable. And, today, the immigrant and the refugee. Tomorrow the town in which I live will consider a resolution which states, in part, that, in the course of normal involvement, the local police department will not ask about immigration status in responding to calls or interacting with the community, and they will not act as agents of ICE, except in cases where an individual threatens the public safety of the community. The immigrant from Central America or from India will be treated the same way I am treated. In an email exchange last night I found out that because I support the Resolution being considered by the Town Board, I have been labeled as a liberal extremist on a website run by a neighbor who is more conservative than I am. I claim the liberal part. I don’t get the extremist part. Unless, that is, doing my best to live the values of my faith make me an extremist. As I think about it, if that is the case, I find myself in good company. Today is a day for dreaming. And maybe even for dreams come true. So, maybe today is also a day to borrow the words of another. 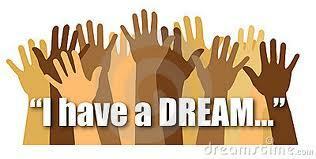 I have a dream of the day when individuals and families will no longer have to live in the shadows or to live in fear. I have a dream. I have a dream of the day when all our children will have the freedom to pursue all the educational opportunities to which they aspire. I have a dream today. I have a dream of the day when those who work hard and who spend their time and energy to pursue the American dream will live as full and welcomed members of our communities and our country. I have a dream. I have a dream that one day we will all learn to live together as neighbors and not as strangers with each of us and all of us doing our part to make our families stronger and our neighborhoods safer and our country better.